MuPhoria third edition has been announced and I would like to welcome this year aspirants to this real world business problem solving contest. The second edition of MuPhoria saw an overwhelming participation of over 2000 students from 317 engineering colleges across the country. This contest has witnessed several changes since the first edition. From a programming contest in its very first edition it was changed to problem solving contest in second edition so as to allow students from diverse engineering background to participate & compete. There was leader board of top five teams in first edition whereas only winning team was published in second edition and will be continued in third edition. This contest designed for final and pre-final year students of engineering students across India provides an opportunity to solve the real world problem by integrating Math, Business and Technology. The solution will be evaluated by a panel of Mu Sigma people. Each submission will be evaluated on the basis of final solution and factors such as scalability of implementation, creativity, the quality of work. Based on the solution, team members of a few top entries will have to go through a telephonic interview and then only the winning team will be declared and published on the contest page. This is a six month long contest starting from July 2014. The winners will be declared for each month with prize money of Rs. 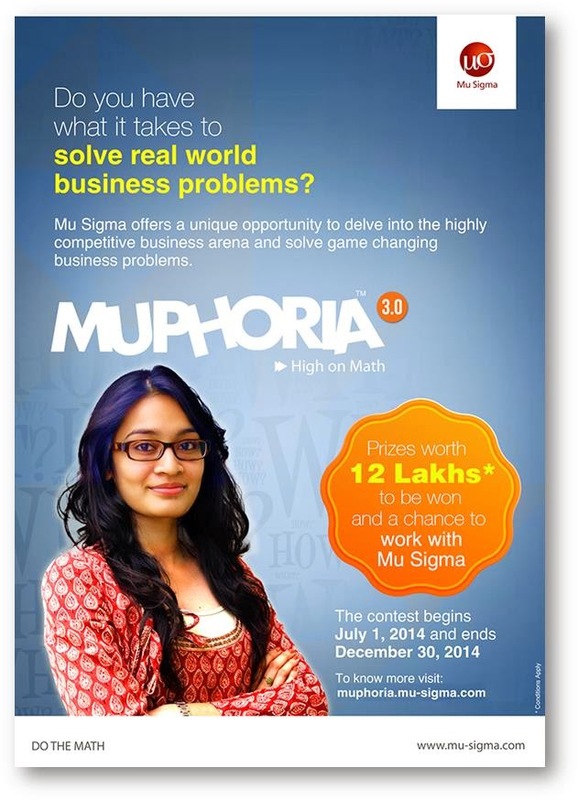 2 Lakhs and an opportunity to interview with Mu Sigma. Prize money will be awarded after a few days of publication of result and interview will be conducted after completion of the contest. Upon selection and joining, the offered candidate will be eligible for one time sign on bonus of Rs. 3 Lakhs subject to completion of a minimum of three months of employment with Mu Sigma. Visit http://muphoria.mu-sigma.com/muphoria2014/ for more information. You will be able to download the necessary documents and data sets after providing a few details. This will be a remarkable achievement for you and of course for your resume. You will learn new things while solving the problem. So start solving the problem to show your talent and to grab the prize money & of course an opportunity to interview with Mu Sigma. Remember the famous quote by Shiv Khera, “winners do not do different thing they do things differently”.Follow us on Facebook and Google+ and stay updated.